Very quiet from a distance. The AR Blue Clean AR383 electric pressure washer quickly blasts away dirt, mold, moss and grime to reveal a fresh clean look. Pressure clean wood surfaces like decks, siding and fences clean to look new again with no need to sand, scrape, or paint. Safe to use on most concrete, stone and stucco surfaces. Clean cars, trucks, motorcycles, RVs, ATVs and bicycles in minutes. Don’t forget patio furniture, garbage cans, pet cages, lawn mowers, outdoor equipment and much more. The AR383 electric pressure washer features a 1.5 HP with 13 AMP universal motor and tri-axial pressure washer plunger pump delivering a peak 1900 PSI to make it a powerful, durable and reliable electric pressure washer. Much quieter than a gasoline pressure washer. The AR383 is certified by CSA International for safety. 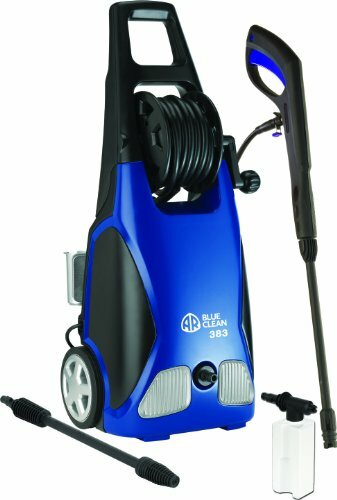 AR Blue Clean is a consumer line of pressure washers from Annovi Reverberi (abbreviated AR) an Italian high pressure pump company with 58 years of pump building experience. All AR Blue Clean products sold in the United States are serviced by friendly employees of AR North America located in Fridley, Minnesota. This electric pressure washer from AR was generally effective at cleaning but slow at removing stains. Other attributes are similarly mixed. The AR was especially quiet, and we judged it very easy to move and transport. But as with certain other models we’ve tested, this washer has a windable hose reel that is no better than a manual wraparound since you have to take off the whole hose to use it–and disconnect at both ends to rewind it. There’s a quick-connect for the hose, but only for the wand end. And since the soap bottle attaches to the nozzle assembly, the nozzle feels much heavier whie you’re washing with a full bottle attached. Easy to move and transport. Easy to operate — just plug it in — but may need an adapter for some outlets. Hose less convenient to store than others. Cord less convenient to wrap and store. Wand not as convenient to remove. On-off switch not easy to read and use. The AR Blue Clean AR383 is part of the Pressure washer test program. In our lab tests, Pressure washer models like the AR383 are rated on multiple criteria, such as those listed below. Noise: A combination of measurements, based on dBA, reflecting the proximity of the operator to the pressure washer. While our Noise score averages measurements taken close by the machine and at the end of the hose’s typical reach, we strongly strongly recommend hearing protection for working close by a gas-powered model in particular. This pressure washer from AR is electric-powered (120v) and claims 1,900 psi max with 1.5 gpm. It comes with three nozzle tips, solid wheels, and the cleaning tip is adjustable. It weighs 22 lbs. Not very effective at power.